All our ponies have excellent temperaments, we were fortunate in our foundation stock. This coupled with firm but gentle handling produces very desirable young stock and we are pleased to see many of our buyers come back for another one. Also we have gained new friends this way. As we farm a 200 hundred acres we have plenty of room for the ponies to run out naturally in groups. All our stallions run out with their mares, they are sweet natured, kind to their mares and foals, and easy to handle. We mostly sell foals and occasionally a few older ponies that have been halter trained in a kind and professional manner. The ponies are hardy as they are raised here on our own farm, at 800 feet above sea level, in open wind swept country. They are all hardy enough to winter out. 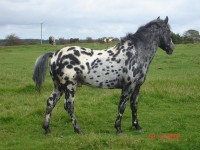 At present we have basically 3 groups of ponies as below:- click link to get more details. Our miniature Shetland ponies are from around 30 to 34 inches.